I have to mention that this post may contain affiliate links. I receive a small commission only if you make a purchase, it does not affect your purchase price in any way. Last July I had the opportunity to visit WDW and I made beautiful Floral and Halo Ears. I never really liked to wear Minnie Mouse Ears but had to have beautiful Floral Halo Ears so I made them you can find the tutorial HERE. Well I found another beautiful pair of Minnie Mouse Ears I had to have! Rose Gold sequin Ears! I did not have time to order a pair but if you know me you know I will just make them! 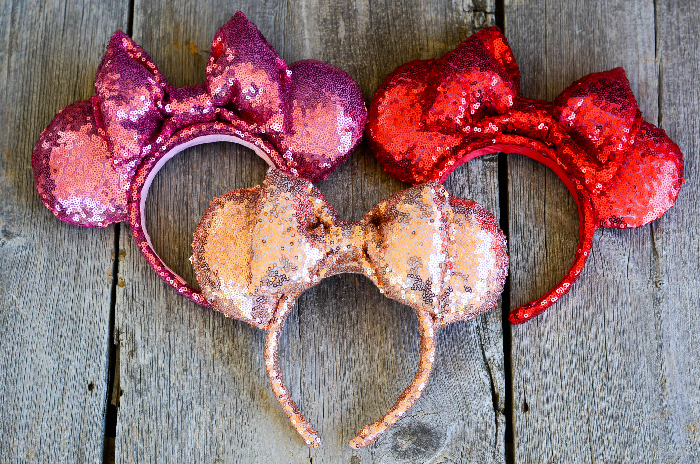 Today I am sharing my easy tips and tricks to making Sequin Minnie Ears. 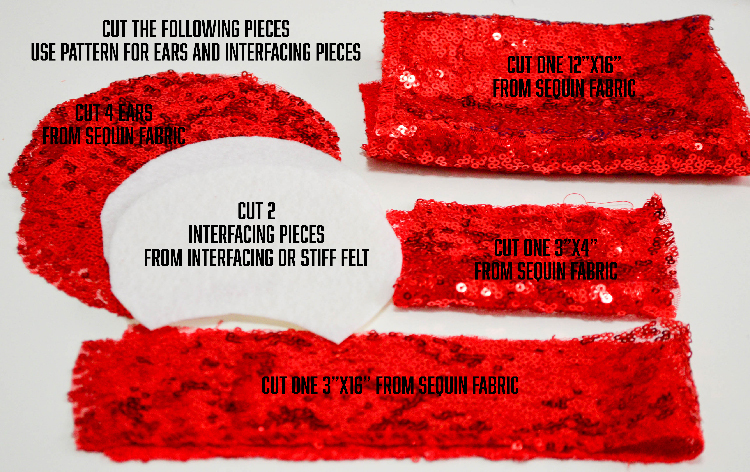 I am sharing this tutorial for DIY Sequin Minnie Mouse Ears today and I have made them in several colors and this tutorial I will be using red sequin fabric. 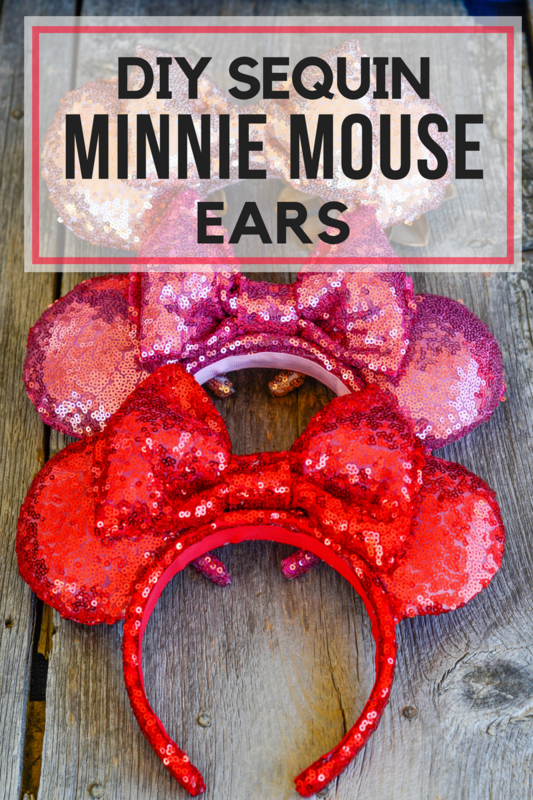 I think I watched a dozen DIY Minnie Mouse Ear videos on YouTube, and I had a really difficult time finding different colors of sequin fabric but sometimes you have to think outside the box and I have a resource for you at the end of the post! Don’t let working with sequin fabric scare or intimidate you it is really pretty simple to work with. It is a bit messy but what crafter works without making a mess! I used a pair of Ears I already owned to create a pattern. I also made Minnie Mouse ears with sequin bows and satin bows this tutorial will cover both versions. 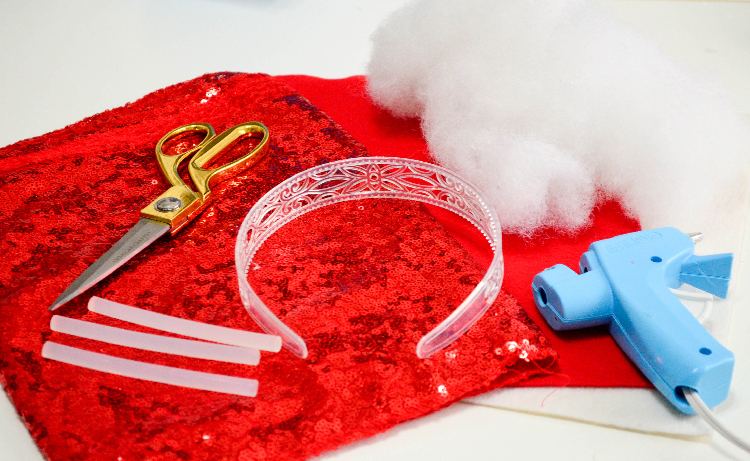 There is a lot to cover in this tutorial so I will break it down into 4 parts: Headband,Ears,Bow and Assembly. I also have an ear pattern for you at the end of the post with all the other resources. Warning lots of photos ahead! I tried to make this a detailed as possible so there is a lot of information! Your ready to start making your ears click on below image to get started! Thank you pretty much for this complete tutorial, hope it's easy as it seems. We are 3 college girls from Mexico, who loves Disney, so we have just a few minnie mouse ears from Disneyland. This tutorial help us so much, we'll put in practice. Again, thank you !! Hey Laura, what colour felt would you recommend layering the Rose Gold sequin fabric with? Pink? Katy, Yes I used a light pink to line the rose gold ears! Hi, roughly how wide are the headbands that you use? Thanks!! Rebecca the headbands I use are about one inch wide. I worry about the sequins messing up my sewing machine, will they? Brenda,I had no problem with the sequins and my sewing machine. I'm excited to try these, Thank you for sharing! Are the headbands you got from Amazon bigger than the ones used by Disney? My problem is that the ones from Disney squeeze my head and I can't wear them longer than to take a quick picture. Thank you for the great tutorial. Diana, I have the same problem and honestly it is just trial and error as to the size of the headband. If I were you I would use a headband you already own that doesn't hurt your head. If that is an option. These are beautiful where did you purchase your sequin fabrics ? Thank you! I have listed resources on the last page. Love this!!!! I mistakenly ordered 1/2" Headbands from Amazon and they are def not wide enough!!! Can you tell me which headbands you ordered? Are they satin covered and do you get the ones with teeth? Thank you so much!!! Thank you for sharing - I am so excited to make these! I was just wondering if the ears stay up well or if they flop around. I have made ears with fabric over cardboard and they were very sturdy, so I'm wondering how these will be once they're all put together. Katie, They stand very well just like the ones you buy in the Parks! Dot, I use one inch wide headbands and I pick them up where ever I can find them! I have even found some at the dollar store! Good luck! Hi Laura, Thanks for a great tutorial. I was wondering if you could sew in the interface as you are sewing the ears together? Thank you for making this tutorial! 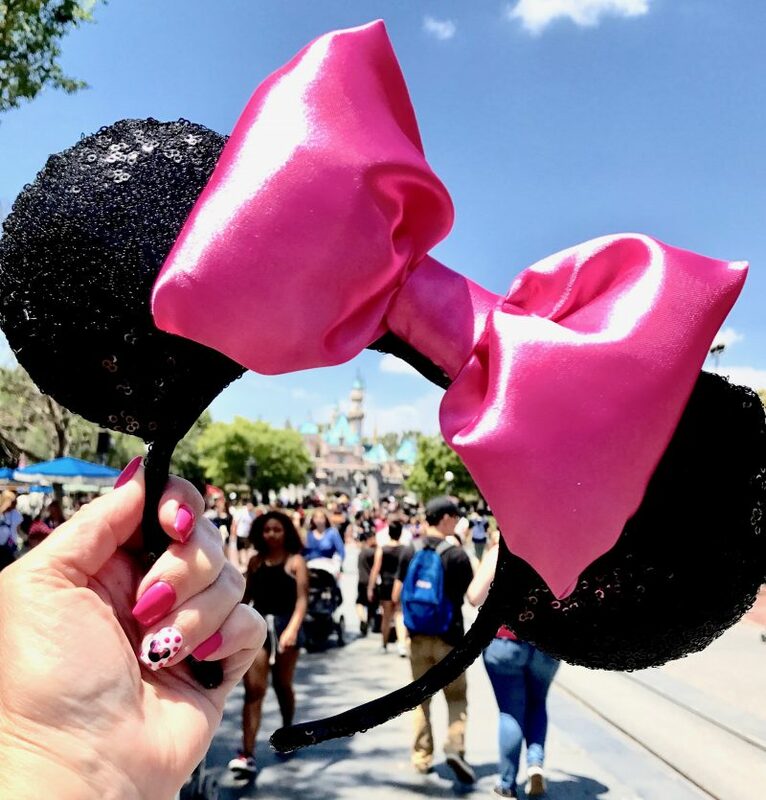 I'm planning a girls' trip to Disneyland soon and I'm wondering how many pairs of ears do you think you could make from one runner? I don't want to order the wrong number! I didn't only because it acts as a stabilizer in the middle of the ear. Plus the pattern piece does not allow for seam allowances. If you placed the pattern pieces carefully I would say maybe 3 per runner. I would order an extra runner just to be safe. If you order from Amazon you can always return it if you dont use it. Thank you for this tutorial! I'm trying to make several pairs of ears at once for a girls trip. About how many do you think you could get out of each runner? I love this tutorial! I have seen/read so many. This is nice and detailed. Quick question, pardon my ignorance but when you talk about stiff interfacing...which kind? I know nothing about it and there are so many types and weights! Also, once put inside the ears you mention 'opening it'? So that means the filling will go inside the interfacing and not between the interfacing and the fabric correct? I was wondering what stitch you used to sew the ears? Hello Brenda, I just used a straight stitch for all the sewing.